I feel a huge sense of pride in Ireland's rugby team. When it was easier to lose this game, Ireland displayed remarkable reserves of courage all the way to the finish line. The nation should applaud their appetite for the contest and their heroic virtue throughout the Test series. The aggregate score was 55 points each in the three Tests, but Ireland are winners because their character and their sense of purpose saw them through. We admire our rugby team because they persevere. It is one of the great enduring qualities in sport and this squad has it in bucket loads. They never give up. What now? If 1.3 million people watched Ireland beat England in Twickenham on St Patrick's Day how many will watch on Saturday, November 17 when the All Blacks come to town? A match full of implication where the two best sides in the world will go head to head - utterly compelling. Joe Schmidt looked a little frazzled in his post-match interview. Ireland were hemmed in for most of the second half and yet they found a way. Schmidt gave Mark Robson, the interviewer, his full attention and yet you could see his mind was drifting to the post-mortem examination. Ireland could and should have done even better when they were in positions of advantage, but our prescriptive coach will ruminate on the series win and the failings which will have frustrated him. His attritional game plan is a problem when you are playing tournament rugby and the coach hit the nail on the head when he said: "I'm not sure we could play again next week." This series win demonstrates that Ireland can go anywhere in the world and win, not just on a given day, but when they want or need to. The reshuffle in the back row and in our midfield left Ireland struggling in their passing game when they needed to go wide and possibly a bit exposed as players, even of the quality of Peter O'Mahony and CJ Stander had to re-imagine their roles. Yet again Schmidt's chemistry worked out a treat. Our back row had monster games and Robbie Henshaw and Bundee Aki stood up to what the Wallabies threw at them. 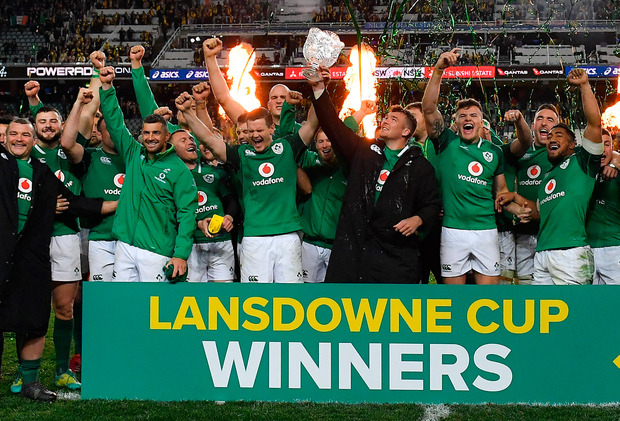 Ireland were undoubtedly the better team over the course of the series and Schmidt out-played Michael Cheika on nearly every front when it came down to thinking and re-thinking. It was a defensive masterclass from Ireland and some of the fingertip tackling demonstrated the resilience and unfailing effort of an Irish side that wanted to win more. Yet again yesterday, as it was throughout the series, the game was pockmarked with frustrating refereeing inconsistency; the game and the series could have been decided by yet another bad call. The Wallaby crowd weren't happy with Pascal Gauzere. The decisive score in the game came from Ireland but maybe the score should have been adjudged on a different basis - certainly if you were looking at the evidence of last week's Test that would be the case. Ireland, as they always seem to do, scored at the death in the first half and were out again quickly to apply pressure early in the second half. They got close to Australia's five-metre line after only a few minutes and won a lineout off a penalty. Ireland have not been good at maul time in the very recent past and you wondered what they would do to counter this. Ireland's line moved forward, they took a man out of the front and Devin Toner won the ball easily moving up to number three, but the Aussies stacked their maul well and though Ireland got close they were held up. From another penalty Ireland decided to go again for a lineout maul and Toner called it beautifully in a game of poker. Australia would also go all in with a game of Sydney Hold 'Em. Niall Scannell does not take much time throwing the ball in, he looks assured in what he is trying to do and his technique is good and consistent. His ball was beautifully flighted right to the very back where it found Jordi Murphy on the 15-metre line, at full stretch. Everyone's timing was perfect - Jack McGrath had got from the front of the line and worked his way 10 metres back to be in the lifting pod with Tadhg Furlong. The Australians gambled as Lukhan Tui and Peter Samu managed to get Izack Rodda in to the stratosphere. The timing of the lift was a millisecond out and if they had got him up a fraction earlier he would have intercepted the ball. His swipe demonstrated how close he was to getting it but it left Australia light on the ground and as Murphy came down from his jump, James Ryan and Toner came in low and hard and packed together. Stander came in behind the two of them and their maul was like a really tight scrum. Australia were too light on the ground and Rodda, Tui and Samu could not get back around quickly enough and Stander got over. It was a high-stakes ploy brilliantly executed by Ireland and their brio paid off. On the replay, you could clearly see Sekope Kepu, from a blatant off-side position and in front of his own try line, firstly trying to illegally sack the maul and then illegally tackle an Irish player who was attached to the maul. Last week Paul Williams awarded a penalty try under the posts with no conversion necessary and put Cian Healy in the bin for 10 minutes for a lesser thing. With Kepu in full sight of Gauzere, why did the referee not do exactly the same? A yellow card is standard procedure when somebody is illegally trying to stop a maul and a certain try. The point here is that Johnny Sexton, surprisingly, missed the conversion. A penalty try requires no conversion. In tight matches that can be the difference. The key to this game was that Australia were not able to finish off their opportunities; despite having so many talented passers and runners they were inaccurate in their penultimate pass. Skills break down under pressure and maybe the Australians, although they matched up in the toe-to-toe physicality, couldn't deal with Ireland's line-speed and pressure defence. It is true that Ireland were missing quite a number of their key players, but I think Australia missed the presence of Will Genia more. Nick Phipps is a decent international, but he lacks the zing and stage presence of Genia and the Wallaby forwards didn't react as positively as they do to Genia. Bernard Foley had a poor game and he was inaccurate in a number of his dealings with his outside players. Australia's lack of depth caught up with them as their replacement scrum-half Jack Powell was well below the level required in this type of game. His low passing forced Foley into knock-ons on a number of occasions. On the other side of the scrum Conor Murray and Sexton, as they always do, controlled the game wonderfully. As long as the two of them are on the pitch Ireland always have a chance at winning. Ireland were under the pump in the last 20 minutes but they had the mental resilience to eke out one last scoring opportunity. I don't know how they do it - instinct, I suppose - and after the year that they have had they still managed to show appetite for the contest and get some phases going. The penalty conceded by Silatolu Latu may have been unpopular with the Sydney crowd, and there could have been calls to say that he did nothing wrong in his attempted poach, but the bottom line is that he was warned here that he was not supporting his own body weight over the ball and the penalty decision was the correct one. Sexton was in the zone, but from that distance and angle it was a long way off a foregone conclusion. However, the contact was really sweet and if your eyes were closed because you could not bear to watch, the sound told you everything. It was a great moment. Australia are two time World Cup champions and were finalists in 2015. Their graph is on the up. To go in to their back yard and beat them is a statement of intent and it elevates our rugby team into a sphere that you could scarcely believe. It was an historic and deeply satisfying win. This island will come to a standstill on November 17.